Japanese airplanes were dropping bombs across Pili, Camarines Sur. People in the city fled the plains and went to different areas to save themselves, to save their families. Some ran to the fields, while the others decided to settle and create homes near or at the mountains. However, the safety of one’s life had a price to pay: there was no water. Barangay Del Pilar is one of the communities that cradled the families who escaped the horrors of those bombings. Located at the upper section of the mountain in Baao, Camarines Sur, it is divided into three zones. As of 2014, it has become home to a total of 75 households, with a population of 384. Among the residents is Cenederio Lopez. He is 74 years old, lives alone, and has never left Del Pilar since he was born. More than knowing the barangay like the back of an old friend’s hand, he never imagined in his lifetime that water would someday become easily available to them. Lolo Cenederio Lopez, 74, spent most of his younger years hiking five kilometers away from his home to fetch water. Now that he no longer has the same strength and endurance to carry containers on his shoulders, Lolo Cenederio is more than thankful to have easily accessible water in his community. 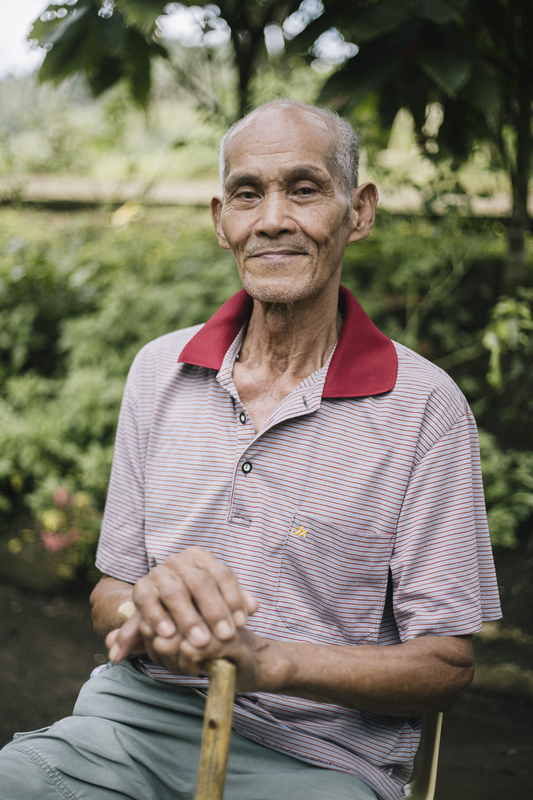 “It was really a sacrifice just to fetch water,” Lolo Cenederio shares. He recalls that it was a daily dilemma for most of his life, rooting back to when he was still a child. Whenever his family would run out of water, his father and older brothers would be up before the crack of dawn to fetch water with their containers and a carabao. Years later, it was still a problem, and it became part of the routine that Lolo Cenderio became accustomed to. Because of his old age, he could no longer hike the way he did when he was younger. What he would do is to buy a water container worth PhP20 from his neighbors, however, this exchange came with a price, he still needed to do an hour’s worth of walking. The situation was simple: he either walked and carried the containers on his shoulders, or there would be no water at all. The trip down from del Pilar was difficult since it would require roughly nine kilometers to the city proper of Baao and back, or a 5-kilometer hike on stiffer, more slippery and underdeveloped roads. Many times, safety was compromised in order to get water for taking a bath or for drinking. If none of the options were available, the community would wait and pray for the clouds to get dark and for rain to fall down on grateful residents. The longest time that the barangay went without any rain was about five months. But finally, after centuries of depending on distant water sources, the dangerous and taxing travel was reduced from hours to just a few minutes away. Through the efforts of the community and Coca-Cola Foundation Philippines in partnership with the Philippine Rural Reconstruction Movement, they paved the way for getting water without compromising the safety of the people. Agos Gravity-Fed Systems bring water from natural springs on higher grounds down to reservoirs near beneficiary communities like Barangay del Pilar in Baao, Camarines Sur. 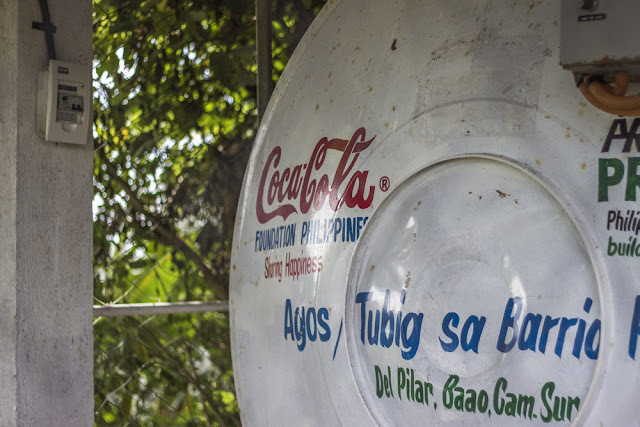 Coca-Cola Philippines, through the Coca-Cola Foundation Philippines, and its partners have established the Agos Program to provide sustainable water access to water-deprived communities. Through Agos, residents of Barangay del Pilar in Baao, Camarines Sur became recipients of an Agos Gravity-Fed System, which brings water from natural springs on higher grounds down to a reservoir near the beneficiary community. “I am extremely thankful to God, our barangay captain, and Coca-Cola Foundation for producing a project like this. Without them, we would not have water to drink,” Lolo Cenederio said. He added that instead of paying PhP20 per container, it has been reduced to just PhP2. It is a blessing that he no longer needs to hike or pay a large amount just to get water. For some, the project of Coca-Cola may just be a simple relocation of a resource, but Barangay del Pilar residents, it only proves that there is hope, there is love, and there is happiness. The Company is also engaged in sustainability projects that aim to help economically empower women, and nourish the youth of today to build better and stronger communities of tomorrow.